Many pressing socio-economic problems need rethinking. Homelessness is one of these. There have been a slew of amazing projects, stories and organisations emerging with new ideas to solve homelessness, a problem that exists everywhere. There’s a commonly held assumption that if you give a homeless person money they will spend it on drugs or alcohol. This may happen. However as people face harder economic circumstances brought on by, and not limited to, global financial crises, housing market crashes and rises in the cost of living nearly everywhere, the number of people who have found themselves without a home has significantly increased. From needing dentures or dog food or money for a hostel, users share their gut-wrenching, heart breaking stories about their lives and what they need money for. At first the site can may feel exploitative. However this feeling quickly turns into a sense of empowerment. There is no shame in sharing difficult situations with people who can help. 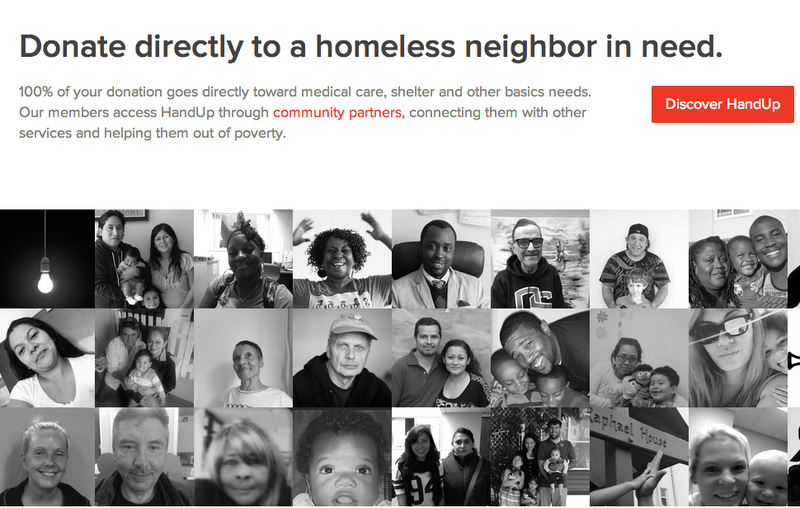 In a way, HandUp is no different that every other crowdfunding platform out there, except this one deals in real, pressing, life changing need (and has no commission fee or project updates required). There is the option to give to the organisation to distribute if you don’t feel comfortable backing an individual and of course the organisation supports loads of people, not just ones who are members on their site. When it boils down to it, I’d rather put my money behind someone in need than someone making potato salad (if you missed this gripping piece of news, some dude raised $55,000 through Kickstarter to make potato salad. True story). For problems more urgent and life-changing than potato salad, check out HandUp. Ps – Mike Monteiro of twitter fame rallies his followers each week to clear the board at Small Can Be Big. It’s very similar to HandUp and equally inspiring. Take a look. And follow Mike on Twitter. He’s funny.